In April’s apartment, the Turtles are busy getting into the Christmas Eve spirit. All save for Raph, that is, who after watching too many Christmas specials on TV, gets fed up with the false sentiment and hypocrisy of the holiday and storms out, vowing not to return until Christmas is over. 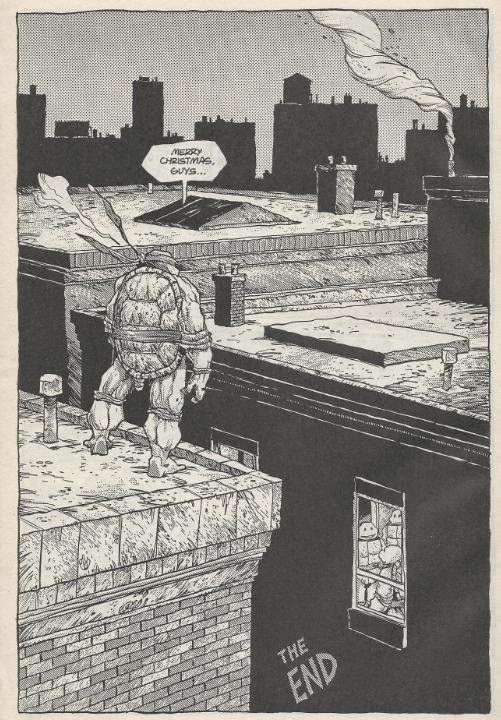 While running along the rooftops, Raph slips on an icy ledge and plummets to the alley below. With an injured leg, Raph decides to hole up in a small nook as the gentle snow flurries give way to a blizzard. He is then awoken from his slumber by a rag-clad vagrant, identifying himself as the Ghost of Christmas Past. Raph is skeptical to believe him, at least until he notices the man leaves no footprints in the snow. Raph agrees to go along with the Ghost, who takes him back to the last Christmas he and his brothers shared in the sewer lair. The Ghost points out that even then, Raph distanced himself from his family. The Ghost then takes Raph to another Christmas, when they were attacked by the Foot in April’s apartment and Leonardo nearly died. Raph suddenly wakes up back in the alley only to be approached by a bag lady identifying herself as the Spirit of Christmas Present. The Spirit takes Raph back to April’s apartment and Raph overhears his brothers and April discussing whether they should go after him or not. They decide just to let Raph do what he wants to do and not force the holiday on him. Raph thinks they sound rather bitter, but the Spirit insists they simply have a different set of values than he does. Raph is bored with the tour, so the Spirit introduces him to his next guide, a tall, silent man in a hooded jacket. The man brings Raph to a swamp where the Turtle is approached by a snarling monstrous wild-man in a shroud. 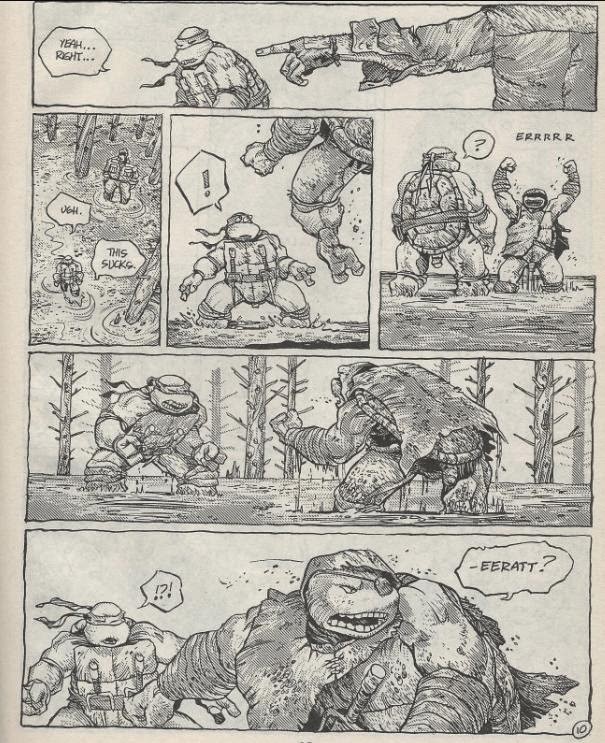 Raph gets ready to fight, only to discover that the wild-man is actually an older version of himself, missing an eye, living alone in a swamp and seemingly devoid of all rational faculties. Raph turns to the tall man for answers, only to see beneath his hood a grinning skull. The realization wakes Raph from his sleep in the alley. Leg mysteriously healed, Raph races back to April’s apartment. From a ledge overlooking the window, Raph quietly wishes his family a Merry Christmas. 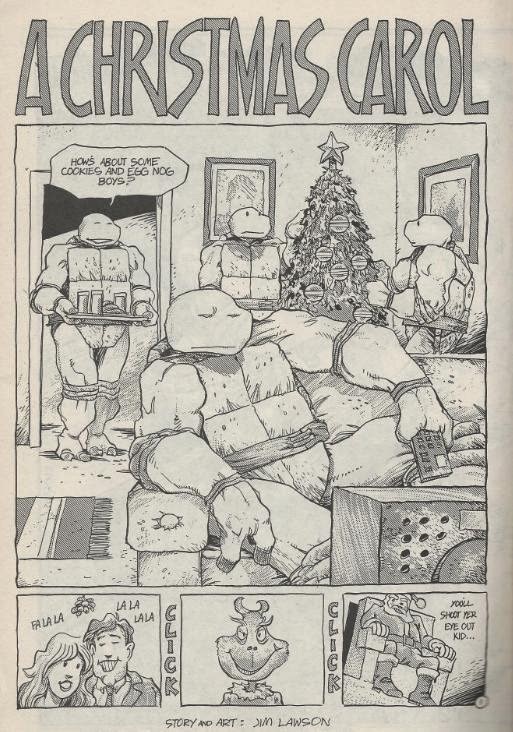 *For my money’s worth, I say the story “Ghosts of Christmas Past” from Tales of the TMNT (Vol. 2) #53 takes place immediately after this one. 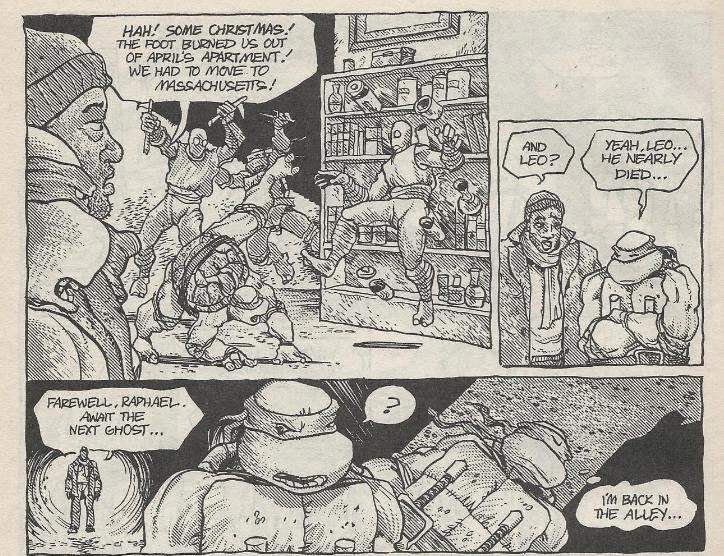 *The Ghost of Christmas Past shows Raph the events of Leonardo (microseries) #1 and TMNT (Vol. 1) #10. *Raph’s future life in the swamp was previously glimpsed in the 1988 story, “Choices”. 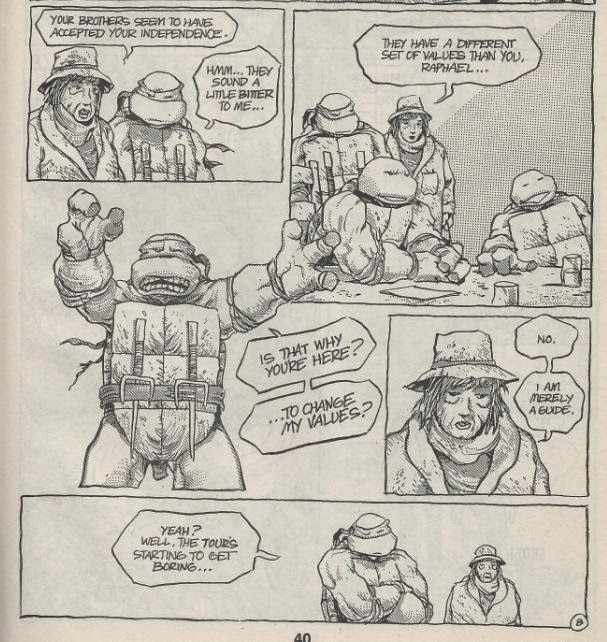 How he lost his eye will be detailed in Tales of the TMNT (Vol. 2) #69. *To date, this story has never been reprinted. Every franchise has to parody Charles Dickens’s “A Christmas Carol” at least once. It’s some kind of rule, I’m sure. Bizarrely, though you’d expect such a thing to be the product of one of the TMNT cartoons produced over the years, it was the uber gritty Mirage comic that gave us our mandatory Christmas Carol parody! The aptly titled “A Christmas Carol” provides an interesting spin on the typical Raphael-centric story we’re all probably so sick of. You know, Raph acts like a jerk, storms off, some calamity forces him to realize his own jerkitude and he returns to his family with a new perspective on life. Until the next issue, where he’s right back to square one and inevitably has to undergo the whole process of trite reflection all over again. Yeah, I know, I sound like I’m overstating it, but if you’ve read as many TMNT comics as I have, you’d realize that this particular plot device has been laid onto Raphael far too many times. For what it’s worth, though, “A Christmas Carol” manages to be an entertaining story despite being a predictable, overdone plot wrapped up in a predictable, overdone Christmas cliché. Back in 1990, this was actually only our second look at Raphael’s mysterious future in the swamp (third if you count that Eric Talbot pin-up), so the mere hint of a terrible future awaiting the grittiest Turtle was enough to make my head spin. Even today, after having many stories set in the future showing us Raph’s swamp-dwelling conclusion, the brief look here remains compelling. I think the look at past Christmases would have benefited from a trip to Michaelangelo (microseries) #1, where Raph joined his brothers in donning elf disguises and giving toys to orphans. It would’ve made a nice contrast from the Christmas where the Foot attacked them and burned down April’s home and maybe have taught him a better lesson about the holiday spirit than one instance out of a million of him being a standoffish prick. As for his trip to the present, well, I dunno. Unlike the other trips, Raph didn’t seem to learn a damn thing from this one, other than that his brothers like to talk smack about him behind his back and that some homeless lady thinks he has inferior values. Lawson’s art for the story is rather good, drawn at a time before he began refining his style down to the utmost minimum of modern cubism. He tends to resort to drawing everyone not wearing a bandana with lifeless black dots for eyes, which often times aren’t even level, which can kind of prove distracting. His action layouts are excellent, though, and I rather dug his idea of personifying the Spirits of Christmas as homeless people. Overall, this 13-page story feels a bit redundant with, I dunno, nearly every Raph story ever written, but when read in conjunction with the story “Ghosts of Christmas Past” you leave with a better sense that Raph might have actually learned something for a change (more on that for my review of that story). The “Christmas Carol” trappings don’t feel like they’re used to their utmost potential, though I acknowledge that you can only fit so much into 13 pages. At any rate, it gives us a peak at the future era of the Mirage universe and if you’re into that, then you’ll want to pick this comic up.